Insecurities are bred in the card isle at Walgreens. There, on the shelves, sit rows and rows of love, adequacy, and self-worth- all for $3.99. There are simple cards, singing cards, cards with glitter, cards with poems, cards laden with sexual innuendos, and cards with pop ups designed to give you a mother f***ing heart attack…all ripe for the picking. As humans we seem to be wired to put so much stock in holidays and the “stuff” that comes with it. We tend to project misguided expectations upon our significant others to create a Disney inspired magical date night that most assuredly will not measure up. We put our self-worth into a ubiquitous card that anyone can purchase. We squeeze an entire relationship into a thin white envelope and hope it accurately conveys all the complexities of our existence. We use these holidays as a benchmark to determine if we are ok enough, loved enough, or worthy enough. But why? Why have we diminished ourselves to thinking that the cards or gifts we receive on holidays, like Valentine’s Day, are all we are worthy of? We spend so much energy focusing on external things to bring us feelings of adequacy and joy instead of looking inward to find all the reasons to love ourselves. It is like staring at your kitchen waiting for it to produce a 5 course meal (or if you are like me, staring at the door hoping Favor shows up with Whataburger). Without doing the prep work- the measuring, the stirring, and the kneading you can’t possibly expect anything to come of your kitchen. You are putting all the pressure on an external factor to satisfy you, when true satisfaction comes from knowing the ingredients intimately and making them work for you. The sweet, the bitter, the raw and the overcooked all work together to create a unique flavor profile that only YOU can produce. The same goes for external proclamations of love- if we don’t do the self-love work we will never be satisfied, we will always be hungry for more. More ubiquitous cards, more empty gifts, more over-the-top proclamations of love. When you find worth and value within yourself regardless of external messages, you will find internal boundless love- a love that is there when you are at your best and your worst. A love that is there on holidays and regular old Tuesdays. You will find peace in knowing your value isn’t tied to anything tangible or fleeting- it is within YOU. You will find that the self-assurance you have within is bigger and better than any over-sized, glittery singing card you will find on aisle 4 of Walgreens. Happy Valentine’s Day! 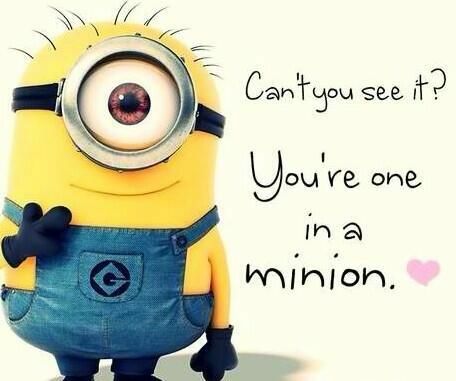 You really are one in a minion.